Flea beetles is a general name applied to the small, jumping beetles of the leaf beetle family (Chrysomelidae). The adults are very small to moderately sized Chrysomelidae (i.e. among beetles in general they are on the smallish side). They are similar to other leaf beetles, but characteristically have the hindleg femora greatly enlarged. These enlarged femora allow for the springing action of these insects when disturbed. Flea beetles can also walk normally and fly. Many flea beetles are attractively coloured; dark, shiny and often metallic colors predominate. The German name Erdflöhe (literally "earth fleas") refers to their jumping ability and this behavior of hiding in the soil. Many agricultural crops are attacked by flea beetles, including various cruciferous plants such as mustard and rapeseed (particularly canola in North America). Numerous flower plants are also subject to flea beetle feeding. 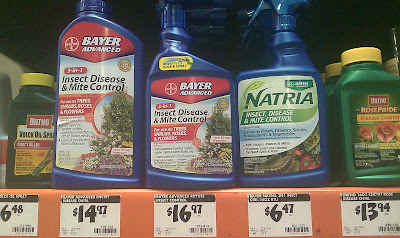 There are many insecticides labeled for treating flea beetles. Most flea beetle treatments are applied as foliar sprays to protect the foliage against the feeding of the adult beetle. 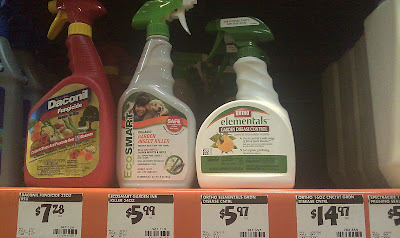 Pyrethrins/pyrethrum sprays have a short residual that persists less than one day. Medium residual can persist as long as 10–14 days. Long residual can persist as long as four weeks.